Twelve Years ago, when Stated Income and No Documentation Loans were the rage, VA Home Loans became unpopular because the Government expected borrowers to actually pay them back. Recently VA Home Loans have been on the rise and are becoming the hot ticket and a great loan to have. One of the many benefits of a VA Loan is the ability to do a Streamline Interest Rate reduction without having to get an appraisal or jump through the normal hoops of income and asset qualification. What is an IRRRL – Streamline VA Loan? Streamline VA refinances are a special privilege provided to veterans who have VA Loans, in that, once the rate goes down enough to show a lower payment on the new loan. Without the typical VA Appraisal or income qualification, the loan is a straightforward process benefitting the VA Borrower by either lowering the payment or trading an Adjustable Rate Mortgage for a Fixed Rate Mortgage. Is My Loan Eligible for an IRRRL? VA to VA Loan: The new VA Loan must be a new VA Loan to replace an existing VA Loan on the same property. This is considered a VA to VA Loan. Would You Like to Know Today’s VA Rates? Am I Eligible for an IRRRL? If you currently have a VA Loan, occupy your property, and the rate goes down, you may benefit for a Streamline Refinance. How Do I know that I am Eligible for a VA Loan? 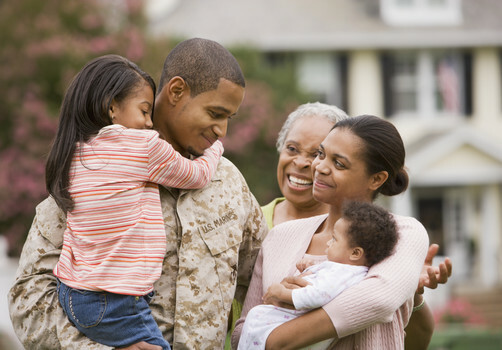 In order to qualify for a VA Home Loan, veterans must have served in the military as follows: Over 6 months (181 days) during peacetime, 3 months (90 days) during war time or 6 years (2,190 days) in the Reserves or National Guard. You may also qualify as the spouse of a service member who was killed in the line of duty. Do I have to Use My Current Lender to Do a Streamline Refinance? No, you do not. Any mortgage lender that provides VA Home Loans usually will be able to provide an IRRRL. In fact, different lenders provide different pricing, so it is a good idea to use a trusted lender and check the market to know what is available. Will I Get Better Pricing If I Use My Current Lender or Is the Loan Easier to Get? Although many marketing flyers make it sound like using your current lender is going to make a difference, but typically the answer is no. The VA Streamline is a straightforward process requiring very little paperwork, but it is still a new loan that replaces your existing VA Loan. Do I Have to Go Through a Credit Check and Get An Appraisal? While the VA does not require a new credit report, most lenders will require a credit check to make sure that you are still able to make the payments. When it comes to the Appraisal Report, different lenders have different rules depending on the market. At this time, an appraisal is not required when getting a Streamline Refinance. Do I Have to Reduce My Interest Rate When Doing a Streamline Refinance? When doing a Fixed Rate to Fixed Rate Loan, you will need to reduce your interest rate and show a benefit in lowering the payment. However, if you have an adjustable rate mortgage and are moving to a Fixed Rate Mortgage, it is not necessary to reduce the rate. What is the Maximum Loan Size for an IRRRL? While the VA does not have a maximum loan size, the loan amount for a Streamline is limited by the existing principal on your current loan plus closing costs and prepaid items. How Do I Know If It is Time to do a Streamline Refinance? If you hear that rates are going down, it may be a good time to check in with your mortgage professional. It is a good idea to do an Annual Mortgage Review each year to keep your credit in check and to make sure you’re in the right loan program. Your mortgage professional has many options and it is important to make sure you are positioned properly. If you have questions, please feel free to call or email Iron Point Mortgage in Folsom and we’d be happy to help. Our New Office is located at 1849 Iron Point Road Suite 120, Folsom, CA 95630. Located in Folsom, CA serving the greater Sacramento, CA Area. Providing Home Loan, Refinancing and Mortgages.